July 29, 2015 – Raytheon has installed the first operational hardware for the Global Positioning System’s Next Generation Operational Control System, known as GPS OCX. The new ground command and control system will significantly modernize U.S. GPS capabilities and manage the next generation of GPS satellites. Installation of the Launch and Checkout System (LCS) hardware was completed in early July at Schriever Air Force Base in Colorado, the eventual home for the new GPS OCX Master Control Station. “Installation of the initial OCX hardware at Schriever AFB represents a key milestone for the program, demonstrating further progress toward next year’s acceptance of the OCX Launch and Checkout System for the GPS III satellites,” said Matt Gilligan, vice president of Navigation and Environmental Solutions at Raytheon Intelligence, Information and Services. “Raytheon is committed to delivering a modernized, secure GPS ground system to support the millions of U.S. military, civil and commercial users of GPS worldwide,” added Gilligan. GPS OCX will deliver a host of new capabilities, including automation for operational efficiencies, improved accuracy, interoperability with geo-positioning and navigation systems of other nations for better global coverage, and a cybersecurity architecture that provides unprecedented levels of protection. With cyber threats to the US and its infrastructures growing daily, it is absolutely essential that the GPS system be fully secure and protected from any possible attempt at hacking or otherwise interrupting or compromising the signals and information delivered from the system. 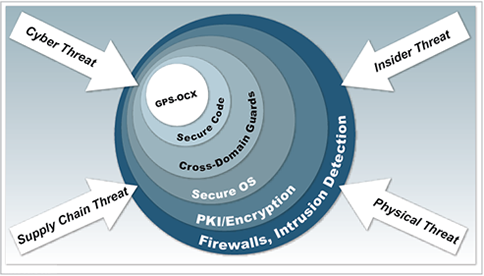 The new GPS OCX system is at the forefront of implementing standards that better protect the GPS mission from all types of threats. OCX will raise the level of protection to unprecedented heights, using a wide variety of technologies and techniques which are compliant with the best practices and standards of the US military and government cyber security experts. U.S. warfighters use GPS services to support air, land, sea and space missions. GPS is also used by millions of people to enhance daily life activities, including personal navigation. It’s also required for industry and businesses and is essential to support safety-of-life missions for air traffic controllers and emergency responders. The modernized ground system will bring new capabilities and precision to the GPS enterprise. Air Force Space Command’s 2nd Space Operations Squadron (2SOPS), based at Schriever Air Force Base, Colorado, manages and operates the GPS constellation for both civil and military users.